Great on steaks, eggs, chicken, burgers, gumbo, soups, jambalaya, seafood and many more food dishes. 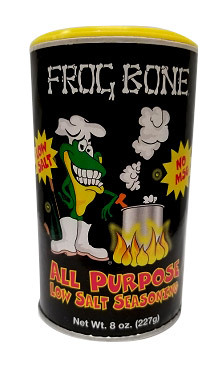 Frog Bone All Purpose Low Salt Seasoning The name says it all, Frog Bone All Purpose Low Salt Seasoning is the perfect substitute for salt and pepper. This all purpose low salt seasoning is full of flavor with a tremendous blend of herbs and spices to enhance the flavor of any food. Frog Bone All Purpose Low Salt Seasoning contains NO MSG and it's Gluten Free. This seasoning is very similar to the regular all purpose seasoning, but with a lower salt content. What can I use it for? Frog Bone All Purpose seasoning is great as a substitute for seasoning with salt, pepper, cayenne, onion powder, garlic powder, etc. This seasoning has all of the above in it to keep it simple for you. You can use it on steaks, burgers, chicken, eggs, gumbo, soups, jambalaya, seafood and many many more dishes. Just simply add while cooking or sprinkle on before eating to add tremendous flavor to your food. Remember, cajun seasoning is not about being hot and spicy but adding great flavor to your food. This product has 140mg of salt per a .25 teaspoon serving size.